In a shallow dish combine chopped rosemary, parsely, and panko crumbs. 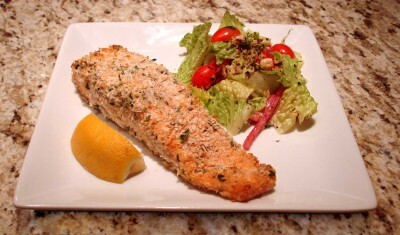 Season the salmon fillets with salt and pepper. Add a teaspoon or so of Dijon mustard to each fillet and coat the sides and top (every side except the skin side). Dredge each fillet in the panko mixture coating well. Place salmon on baking sheet skin side down. Lightly spray each fillet with nonstick spray, this will give the fish and extra crunch under the broiler. Broil for 10 minutes.